The Dobermann originated in Germany. In the 19th Century a man named Herr Louis Dobermann lived in the city of Apoldo (East Germany) in the principality of Thueringen. He served as the town dog catcher, night patrolman and the rates collector among other duties. There was a demand for fearless watchdogs and Herr Dobermann started selectively breeding the best of the locally available dogs for this purpose. Nobody knows exactly which breeds were originally used, but the Great Dane, old German Shepherd, (not the German Shepherd Dog as we know it today), Weimaraner, Manchester Terrier, Greyhound and other breeds have been mentioned. During a lifetime of 60 years of interbreeding dogs, Herr Dobermann achieved great success in establishing the required watchdog breed of dog. The Dobermann was known as the ‘Devil Dog’ by the American Marines and is their mascot. It earned the name during World War II in the Pacific, where it used to go ashore with the marines and flush out the enemy. Although current research indicates their arrival was in fact a lot earlier, the Dobermann was re-introduced into Australia in 1952. These sleek and loyal dogs usually live up to 12 years of age, but with the correct care and nutrition will live to 14 years of age. With this lithe and powerful animal the female usually weighs 30kg and is 65cm tall, with the male being a little heavier at 40kg and 69cm tall. It is in the Dobermann's nature to be a trustworthy and loyal companion, usually gentle but as robust and tough as you care to make it. A great playmate for the children of its ‘family’, it will quite happily join family members at the table and even sleep in their beds, if people are foolish enough to encourage it. In fact, it will become very ‘human’ if you forget to remind it that it is a dog! Though affectionate and obedient to its owners, the Dobermann can be quite stand-offish to those it does not know. However, it should not be nervous or aggressive in normal circumstances, as a dog like this is unreliable and will react badly in times of stress. The Dobermann is a large, active and intelligent breed and you must be willing to provide the exercise and attention it needs. Anyone buying a Dobermann must realise that it requires daily training and exercise. 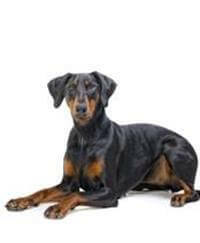 A Dobermann needs some type of control if it is to fit happily into the family and tends to excel at obedience. Whether you just want to do basic obedience, or advance to the highest level and obtain obedience titles, both you and your dog will enjoy and benefit from this activity. A Dobermann must be housed with adequate fencing. Because the Dobermann was bred as a working dog, many see the dog's mentality and aptitude for learning as being just as important as its conformation. The purpose of the Working Aptitude Evaluation, in place for some time, is to help determine if your Dobermann has the aptitude to do the type of work for which the breed was intended – that of companion and protector. Being a large dog this animal is best suited to those people who will train, socialise and exercise this loyal pet.